Ridge Runner Cheyenne Bowie With Sheath | BUDK.com - Knives & Swords At The Lowest Prices! This knife is well balanced, lightweight and very sharp. my brother likes it too and wants one also. 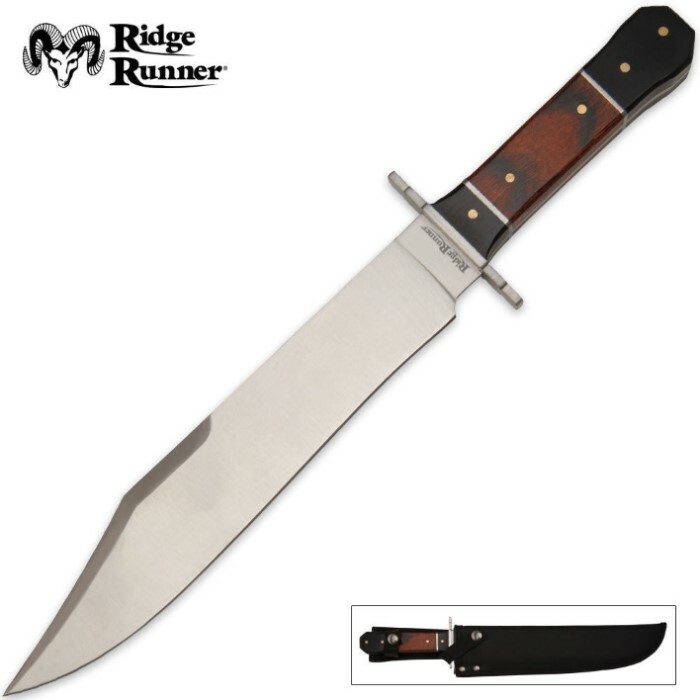 This is a knife that every survivalist or plans to become one should have in there possession. A VERY NICE KNIFE WHICH IS STURDY AND WELL MADE. I ORDERED ONE AND THEN A SECOND. TOO GOOD A DEAL NOT TO HAVE A BACK UP. WOULD MAKE A GREAT GIFT FOR SOME ONE WHO APPRECIATES A KNIFE THAT IS STURDY. This is a heavy, well built knife. Sharp and useful out of the box. It is pretty enough to have in a collection, display, and strong enough to use at camp on a daily basis. This knife is one of the best I have received from BUDK. It is balanced, full tang, well crafted and the blade is just plain awesome! Very good for the price. Definitely a great buy for any collector. Not sure if it will hold up in a zombie apocalypse though. I received this knife five days after ordering it on line. I am happy with both knife and sheath! For once the sheath that came with this big Bowie wild boar destroyer is a heavy duty nylon sheath with a thick plastic liner and two retainer straps and should give a hundred years of hard service. The knife was solidly built, made in china but appears to be of good quality with only several small blemishes at the guard/handle area and the grip was plenty big for my hands and everything was tight and solidly put together. Even with the few blemishes, this knife is well worth the price and over all I rate it at a solid 5. This is not a show piece and made for serious use in the woods and will provide you with protection against wild boars, Bigfoot, and zombies not to mention being a good camp or survival knife. It is strong being a full tang Bowie and 100 per cent functional! You can't go wrong with this one. Happy trials. Very nice fultang prity salled knife. The sheth is nise nilon with a hard plastic insert. i jest hat to pop two buttens to get the knife. Also the knife gets cot on the top butten when i put it back in. Thinking of discarding the top one. Kinda a hassel. Worthy of the price. I've had a short and incomplete review so far. First Impressions are that it will work fine for camping or general use. That's what I wanted. Smash and bash with out remorse. The steel is good type for that. I sort of agree that the handle is a little short, but its fine too. I like the sheath, double snaps, good rivets, and a nice plastic insert sleeve. Thumbs up there. Knife snobs look elsewhere. Knife users will appreciate this as a good value. I suppose for $12 not much can be expected. The blade was dull and wouldn't hold an edge after sharpening. The handle is awekward and square. The knife just looks and feels cheap. This is a very good knife overall the only complaint I have is that the handle is somewhat skinny for my hands, but that's not a huge problem as I plan to redo that part anyway.